First- happy Saturday! Saturday’s my favorite holiday, and it comes every week- it is so, so welcome right now. This week has been loooong. Okay, now to the good stuff- I bought a jar of spicy kimchi, planning to eat it by itself, as usual, but thought a hot dish would be a better bet in January. Our local natural foods store had some beautiful, brown, farm-fresh eggs (cage-free, hormone-free, grain fed, generally pampered, etc. 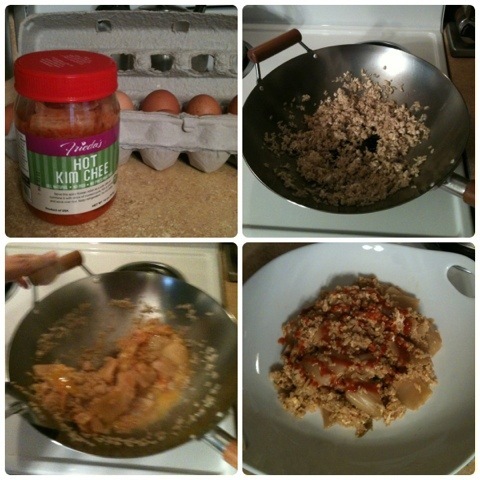 ), so I grabbed a dozen and used two in this fried rice. Heat your wok or large frying pan over medium-high heat. Side note: The wok in these photos was a thoughtful Christmas gift from a beloved friend- I have never been so excited to season a pan as I was with my wok! Thank you, Shahla! When the pan is hot, add your oil, and swirl to coat pan. You may need less oil if you’re not cooking with a wok. Add your cold rice, and quickly cook, stirring rapidly, for about a minute. Add the kimchi, and repeat. Pour in the eggs, and toss with the kimchi and rice until set, but not so set that they’re crumbly (about one minute more). That’s it! Serve! I served mine with sriracha, and would have added chopped green onions or cilantro if I’d had them on hand. I think the green onions would have been a tasty touch, and a shot of green would really pump up the look of this dish. This entry was posted in Dinner, Easy, Fast, Gluten free, One Pot, Quickie, Vegetarian and tagged fried rice, kimchi, kimchi fried rice. Bookmark the permalink.